Tighter legal and environmental regulations are ensuring that the chemical companies remain in the market for the latest continuous emissions monitoring systems. The worldwide market for continuous emission monitoring systems (CEMS) is expected to grow at a compounded annual growth rate of nearly ten per cent over the next five years, according to a new ARC Advisory Group study. The main factors that are contributing to the growth of CEMS worldwide are legal regulations and increased awareness of environmental protection needs. According to CEMS Worldwide Outlook, total shipments in 2008 - including hardware, software, integration, and maintenance services - exceeded US$550 million. Due to the current adverse economic conditions, market slowdown is expected in the second and third quarter of 2009 with a recovery in 2010. New and innovative measuring technologies and automatic maintenance procedures are needed to lower the total cost of ownership of CEMS. This, says the study, will significantly increase the CEMS market penetration among small-scale manufacturers. ARC's study also points to the software-based predictive emission monitoring system (PEMS) as being a cost effective alternatives to CEMS. A PEMS consists of an emission model that reflects the relationship between process operations and ambient conditions to emission and a sensor validation system to ensure the accuracy of the predicted emissions data. "The main attraction of PEMS over hardware based CEMS is their total ownership cost advantage, which could be as much as 50 per cent in some applications," notes the study. As if to illustrate the study's point about the need for new and innovative technologies, leading provider Quantitech now offers customers what it is describing as a revolutionary future-proof gas analyser which can protect against any requirements to monitor new parameters in the future. The FTIR Gasmet DX-4000 can monitor up to 300 different compounds of varying concentration and other gases can be added for future applications at little or no extra cost, creating a future-proof instrument (Fig.1). FTIR stands for Fourier Transform Infrared, the preferred method for infrared spectroscopy. An FTIR spectrometer obtains infrared spectra by first collecting an 'interferogram' of a sample signal with an interferometer, which measures all infrared frequencies simultaneously to produce a spectrum. Sample identification is possible because chemical functional groups absorb light at specific frequencies. In addition, through calibration of the spectrometer, it is possible to determine the intensity of the absorption (relative to the component concentration). The Gasmet FTIR gas analyser can measure any gas, with the exception of inert gases, homonuclear diatomic gases and hydrogen sulphide. 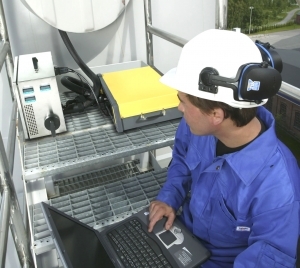 As a multicomponent gas analyser, it is ideal for customers that need to analyse multiple components, hot/wet gases, or any gas in complicated gas mixtures. The Gasmet library of reference spectra consists of reference files of gas spectra measured to-date with different Gasmet gas analysers. The library contains hundreds of spectra and each reference spectrum contains both quantitative and qualitative information about the component. Quantitech's Dominic Duggan says that in comparison with multiple analyser CEMS, the FTIR is extremely easy to operate. "Zero point calibration with nitrogen (background) just takes a few minutes and is required once a day. Under normal circumstances no other calibration is required which saves users a great deal of time, effort and money. However, water vapour calibration must be performed after every major maintenance operation and at least once per year." Paul Conroy, development engineer with Scottish carbon fibre manufacturer SGL, explained: "The DX-4000 is a perfect instrument for us because we need to simultaneously analyse a large number of components which are created during the carbon fibre manufacturing process. 'We are also easily able to add different gases in the future and modify the settings, which means that we don't have to upgrade equipment or buy a new instrument. We have also received excellent support and guidance from Quantitech since we had the first analyser installed two years ago." Summarising the benefits of FTIR over traditional techniques, Dominic Duggan says, "The Gasmet FTIR systems that we have installed record a full analytical spectrum for each measurement. This is important for three reasons; firstly, it enables the system to measure a wide variety of parameters with just one instrument; secondly, it enables us to analyse old spectra in order to measure new parameters (that we did not need at the time) and thirdly it is relatively simple to add new parameters which is why we call it future-proof." Another company focusing on CEMS is Allison Engineering. Its new MT multipoint mass flowmeters are designed for gas and air applications, making them suitable for measuring and monitoring stack emissions. Complaint with ISO 14164:1999 (E) Annex B, they are designed for combustion air and flue gas flow measurement and monitoring in large ducts with irregular velocity flow profiles. They can average up to 16 individual flow sensors at temperatures up to 450°C and include a continuous auto-test function with alarm diagnostics. Other features include averaging filters, which dampen response to rapid process fluctuations, RS232C serial ports to enable communication with in-the-field instruments and menu-driven control for ease-of-use. MT flowmeters are rack-mountable with card slots for expansion and future option modules. The flowmeters' modular design and interchangeable components enable simple maintenance. The flow element is made from stainless steel while the electronics enclosure is rated to NEMA/CSA Type 4. According to the company, MT multipoint flowmeters are ideal for measuring mass flow anywhere that variables conditions limit the effectiveness of single-point flowmeters. They can operate in harsh environments in the oil, gas and process installations industries; and wherever temperature, vibration, abrasion and corrosion pose difficulties for other meters. Meanwhile, leading gas analysis company Servomex has highlighted how active the market still is with a contract to supply a complete analyser system for a PTA plant being constructed by PetroquímicaSuape in Ipojuca, Pernambuco, Brazil. Contracted through Aker Solutions, a leading global provider of engineering and construction services, technology products and integrated solutions, Servomex will supply six SERVOTOUGH OxyExact (2200) oxygen analysers, six SERVOTOUGH SpectraExact (2500) process analysers, sampling systems and three TOC analysers to the new PTA plant. The company also will oversee the design and build of two bespoke analyser houses, which will include full HVAC systems to ensure a stable operating environment as well as all internal plumbing and cabling required to monitor the gas streams and to report data. Designed to measure corrosive, toxic and flammable sample streams, the SpectraExact series of photometric process analysers offers single or dual component gas analysis to suit virtually any process, combustion or emissions gas analysis application, while the OxyExact utilises Servomex's high specification paramagnetic oxygen analyser for optimum process and safety control in general and high temperature applications. In combination the SpectraExact and OxyExact will provide a total, accurate and reliable solution for the monitoring of PTA processes for PetroquímicaSuape, with both units offering a rugged, durable construction that makes it ideal for application in the volatile environments of PTA production. "Servomex is delighted to be chosen to supply a total gas analysis solution to PetroquímicaSuape," said md Chris Cottrell. "Not only are we pleased that our excellent track record in PTA plants is recognised and valued, but also that we can demonstrate the same exacting high levels of service and support in our South American operations that we apply elsewhere."